Beautiful Super Bowl Sunday shaping up, with the "warmest" temperatures and sunniest skies of the next five expected across the region. 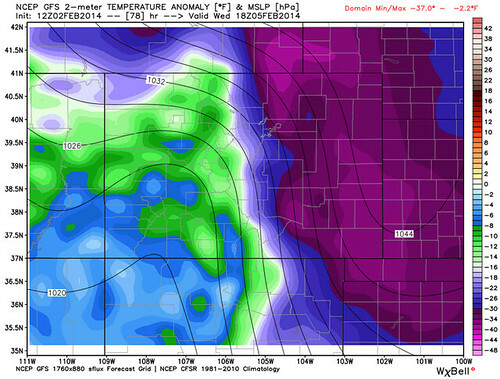 Arctic air is poised to move back into the state late in the day Monday with, with an increased chance of snow. Tuesday through Saturday one should expect off and on snow with frigid temperatures. At this time, our best chance at appreciable snowfall at this time appears to be Monday night through Tuesday night. There remains disagreement between the models, but as it stands this morning it does look at least a couple of inches will be possible during this period, especially over southern and western portions of the metro. By Tuesday the cold air will be fully entrenched, with shots of reinforcing cold air expected through Thursday. 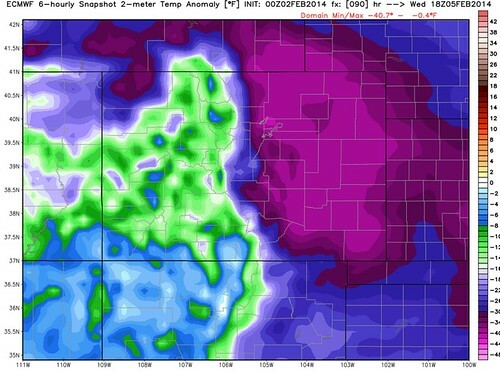 Take a look at the ECM with -30 F temperature anomalies across eastern Colorado by Wednesday (left), and a very similar idea from the GFS (right). For now leaning a bit warmer in the forecast than what the Euro has, but it could be we actually end up lowering temperatures from where we have them now as we head into the week. 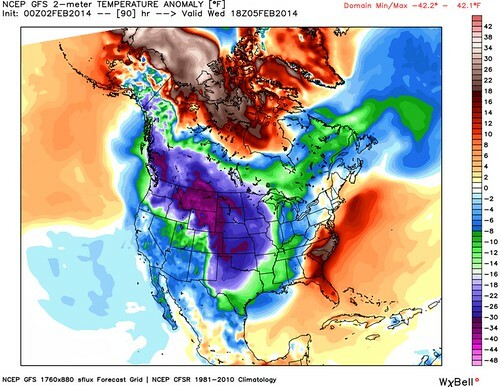 This cold will be nationwide, with focus of the cold over Montana, Wyoming, and Colorado. Only the southeast is expecting well above normal temperatures Wednesday. Snowfall chances become a bit more murky as we head into the later half of the week. For now will leave a slight chance of snow each day and make adjustments as needed. Enjoy the sun today, and bundle up this week!